May 9, 2017 — Today, FIFA has once again succumbed to Israeli bullying. FIFA’s press release makes clear that the organization has removed the issue of Israeli football clubs based in illegal settlements in the Occupied Palestinian Territory from its agenda at its upcoming annual congress this Thursday, claiming “it is premature for the FIFA Congress to take any decision” on the matter. FIFA should know that justice delayed is justice denied. Israel’s repression of Palestinian sport and athletes has no place in world football. Israel should not be able to base its football clubs on stolen Palestinian land, bomb Palestinian stadiums, violently attack Palestinian athletes, and restrict their movements or subject them to arbitrary arrest while enjoying impunity. Israel has made it abundantly clear that it has no intention of respecting Palestinian rights, on or off the field. FIFA is shamefully bending to Israeli bullying by continuing to apply a double-standard and making a mockery of its stated commitment to respect human rights. 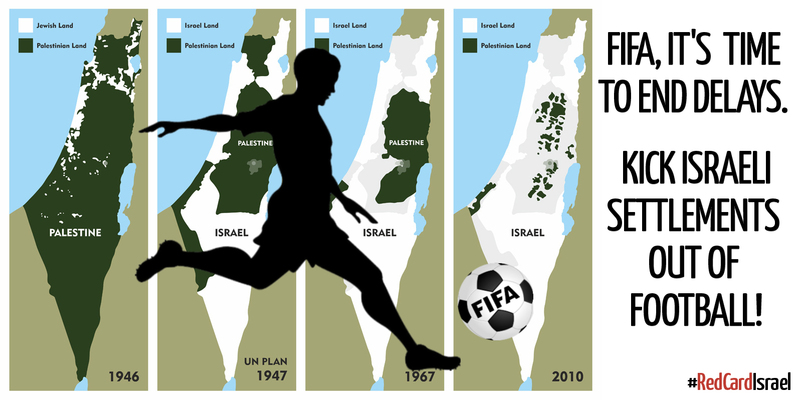 For two years, FIFA has ducked its responsibilities and allowed the Israel Football Association to violate FIFA’s own statutes by including football teams based in illegal Israeli settlements built on occupied Palestinian land. After bowing time and again to Israeli intimidation, FIFA had a chance to correct its disgraceful record. But it seems FIFA President Gianni Infantino is bent on following his predecessor’s corrupt path. Despite FIFA’s capitulation to Israel, the Palestine Football Association (PFA) has submitted a motion for debate on Thursday at the FIFA Congress (agenda item 14.3). FIFA will likely have to vote on it, as Israel would need three-fourths of all member associations present to obstruct the PFA’s motion. FIFA congress members have an opportunity and responsibility to stand on the right side of history by voting on this motion. We call on FIFA members to uphold Palestinian rights and vote for the suspension of Israel’s membership given Israel’s persistent disregard for FIFA statutes and its outright refusal to exclude settlement teams located on occupied Palestinian land from its league. FIFA has an unequivocal policy against racism and has played a historic role in the fight against apartheid. South Africa’s apartheid regime was kicked out of FIFA. Why not hold Israel to the same standard?